RALEIGH, N.C. – Smith, Anderson, Blount, Dorsett, Mitchell & Jernigan, L.L.P., a 120 lawyer full-service law firm in Raleigh, is proud to announce that the Firm received the 2012 North Carolina Employer Support of the Guard and Reserve (NC ESGR) “Pro Patria” Award. 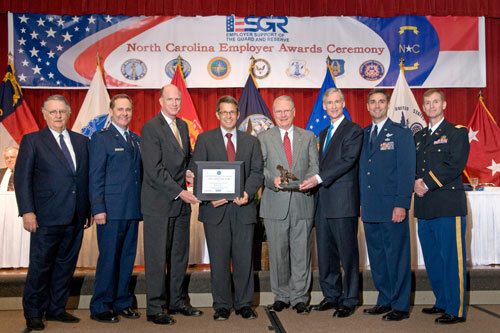 Smith Anderson was one of four North Carolina employers that received the award at the North Carolina Committee of the Department of Defense ESGR Banquet held in Greensboro, North Carolina on March 17, 2012. The Firm also received the “Above & Beyond” Award, which is a prerequisite to receive the “Pro Patria” Award. Smith Anderson attorneys Jim Dorsett, Mike Weddington, David Hayden, and David Clement attended the banquet to receive the “Pro Patria” Award on behalf of the Firm. The “Pro Patria” Award is the NC ESGR’s highest state level award given by the Department of Defense. The award is presented to those employers who demonstrate exceptional support for our national defense by adopting policies that make it easier for employees to participate in the National Guard and Reserve.